I cannot believe that it is the end of March and the end of Vegetarianism 2.0 Week #4!! Time is flying and it seems like I am getting everything and nothing done at the same time. It’s not just me, right? About the four-week point of my Lenten vegetarian journey, I start to crave bacon. And filet mignon. And roasted chicken. And pulled pork. Basically, my body has had enough of all the veggies and wants me to eat a rasher of bacon with a side of steak bites. To combat this high choleric craving (and spare my heart), I usually whip up some hearty, flavorful fare to soothe my cravings. I’m in love with these spiced chickpea patties (especially because they are pan-fried! ), but I do not have the time or equipment to make them from scratch in my grad school apartment. This summer when I’m home with a fully equipped kitchen, maybe I’ll make the attempt to make them from scratch. E was over for Sunday dinner, so this was a good meal to share. 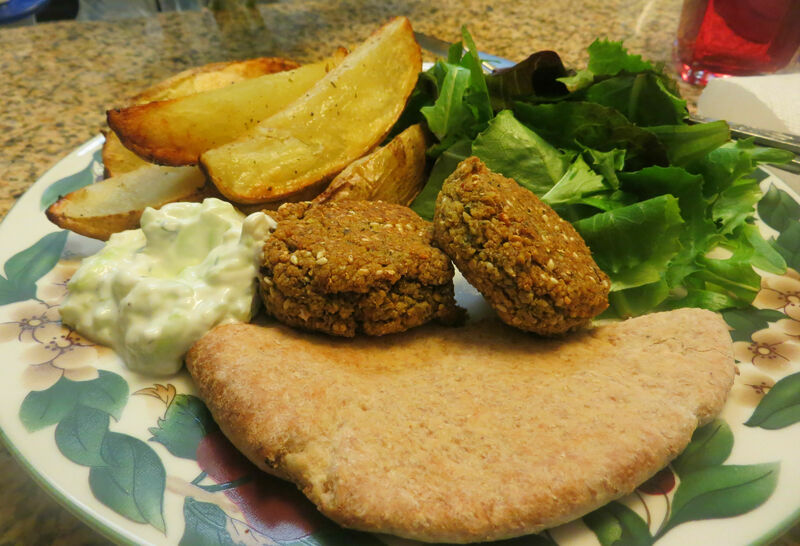 I put together plates of falafel, pita, lemon potatoes, and salad and we could each eat our falafel the way we wanted too. These fiber-packed nuggets of awesome are delicious dunked in tzatziki (Greek yogurt sauce) and made my yearnings for bacon dissipate. Since my thesis and Master’s competency exams needed my full attention this week (and bacon daydreams becoming increasingly more distracting), I decided that I needed to make a full-flavored dish that wouldn’t make me miss animal protein (and still keep me satisfied). 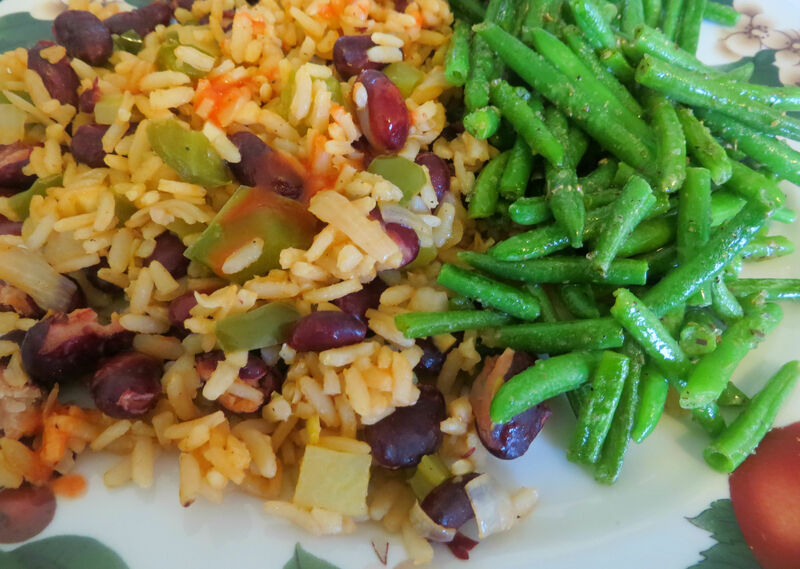 So I made Robert Irvine’s Rice and Beans… only with Alton Brown’s brown rice (which is made in the oven – no more drama over stove top brown rice!) instead of the recipe’s call for white rice. This quick substitution was simple and easy, and made an already nutritious dish even better for me. Only 3 weeks left! What are your favorite vegetarian recipes? Is there something that you want me to try? Let me know!